The University of Arizona Museum of Art presents the metallic creations of Andreas Nottebohm. Two exhibitions of Nottebohm’s work will scintillate in UAMA’s galleries. The Main Gallery will feature Nottebohm’s current work in an exhibition entitled Andreas Nottebohm: Raw Metal; the Hanson Gallery will display his work from the 1980s that was commissioned by NASA as well as the NASA work of Robert McCall. Nottebohm’s work is about light, space and infinity. His 1980s NASA commissions featured acrylic paintings on aluminum and explore space as a concept. The viewer is presented with the luminescence of space, its limitless volume – and a sense of wonder at being on the threshold of exploration. In contrast, UAMA presents the NASA paintings of Robert McCall that capture McCall’s vision of man IN space. The Main exhibition, Andreas Nottebohm: Raw Metal, displays the artist’s current work. Creations from the manipulation of raw metal fascinate the viewer as much by their “how did he do that?” quality as by the artistic statement that draws the viewer in, evokes wonder and puzzlement. Long after you figure out how it was created, the viewer will ponder the visual sensation of the creations. Curator Lauren Rabb states, “Experiencing Nottebohm’s work is to take yourself on a journey to the unknowable. UAMA invites you to get out of the heat and explore the ‘cool’ of Nottebohm’s space. 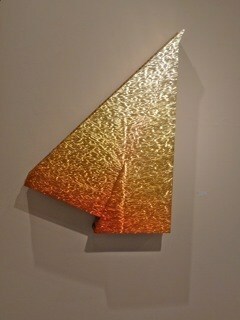 Andreas Nottebohm: Raw Metal is on view from May 26 through September 11, 2011. Join the artist for a reception on August 25th.